As a writer, the most common question folks ask is “How do you write the whole thing?” The whole thing being a novel. I start with an idea. It can be a character. The plot can pop into my head without characters. Often it’s a powerful scene from within the story that grabs me by the collar and shakes me until I write it down. Different stories have different impetuses. Once I start a novel, I have a general understanding of where the story will go. The Esau Convergence came to me after I saw the cover art (my graphic artist is a GENIUS) for The Esau Emergence. In fact, I wrote the last chapter of The Esau Convergence first. I know there are at least two famous quotes about writing the end first. I just can’t correctly attribute them so apologies for butchering them. One says something like I always write my ending first to anchor the story and then when I approach it, I change it. I only read that quote recently so as the story progressed, I grew worried I couldn’t get my plot to arrive at the ending. Of course, things needed to be tweaked. I closed my eyes and ripped through the changes. You’d think it would be easy for a writer but let me tell you…revision is tough. Particularly when it’s an origin of sorts for your story. Often in the writing process, characters choose different paths than I intended. They say or do things that surprise me. I was almost done with a chapter in The Esau Emergence when I realized one of my characters was going to die. I spent three or four days trying to work around it to no avail. When in the zone, I feel the Fates take hold of my imagination and weave their handy work without my input. One of my Convergence beta readers demanded a scene I hadn’t written. After giving it some thought, I realized the scene didn’t exist. The characters weren’t going to face off in a battle. Their relationship had evolved beyond the conflict and one of my main protagonists quietly arrived at his self-actualization. No trumpets, no fanfare. Note he isn’t completely on board with some things, but he took a big step. It happened without me planning it. This evolution of story happens on the six hundred word days as well as the three thousand word days. Granted, it feels more miraculous on those three thousand word days. The Beard often says, “Get those characters under control.” Any writer will understand, the characters in my head are living breathing entities with distinct minds of their own. I can sometimes ease them into a scene if they are belligerent, but more often than not I’m the one buckling up for the ride. I have more say during the editing process. The characters have said what they like and are more willing to negotiate. 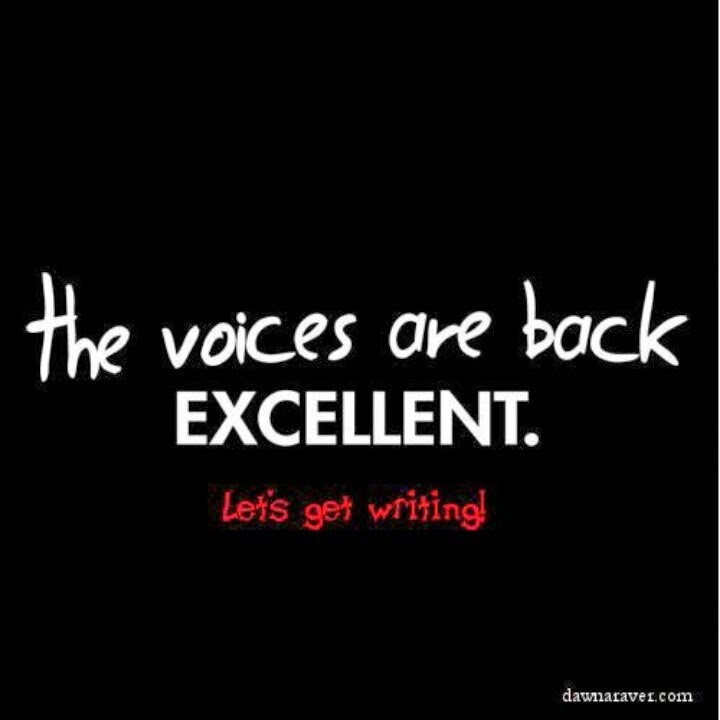 I see so many ‘voices in my head’ quotes about writers. Clichés? Yes, but truth at its core. Sure I sing in the car, but if you see me talking to myself, I’m hashing it out with my characters.